January is always an exciting month here at Zildjian and in the music instrument industry in general. It's when companies introduce their latest and greatest offerings at the Winter NAMM Show in Anaheim, CA. If you're not familiar with NAMM (National Association of Music Merchants), founded in 1901, it is the world's largest trade event for the music products industry and the biggest gatherings of musicians, retailers and manufacturers on the planet ...and it's an absolute blast! Located right next door to Disneyland, this is Disneyland for musicians of all kinds! Ready to rock 2017, we arrived at the show with 16 NEW Cymbals, 4 NEW Music Cymbal Packs, and 3 NEW Drumsticks! Check them all out below! From the NAMM Booth - Zildjian's Paul Francis test drives each new K Custom Special Dry Cymbal! The original dry sound that we created over a decade ago has been completely remastered for today’s modern music. Raw and earthy, these cymbals deliver a dry, funky sound with a fast attack and lots of trash for a unique expression of personality. An innovative three step hammering process, distinctive shape and extra thin weight give the cymbals a fast attack, while shutting down quickly with just enough sustain. This sound, combined with the dark, dirty appearance make the new K Custom Special Dry exactly what today’s drummers are looking for. 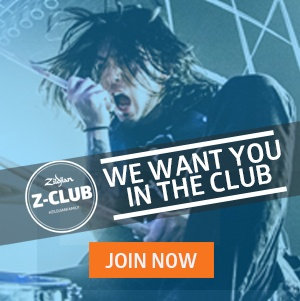 With 16 new models available, some unique features include larger size Crashes, a dynamic 14” FX HiHat Top with a unique hole pattern to emulate a “filtered” sound and Trash Crashes to create a unique white noise sound that projects through any live performance. This new cymbal voice is an extension of its world-renowned K Custom family. We’ve taken the art of cymbal making to the next level and have left the imitators behind. This is #DryDoneRight. Our picks for your style of music. 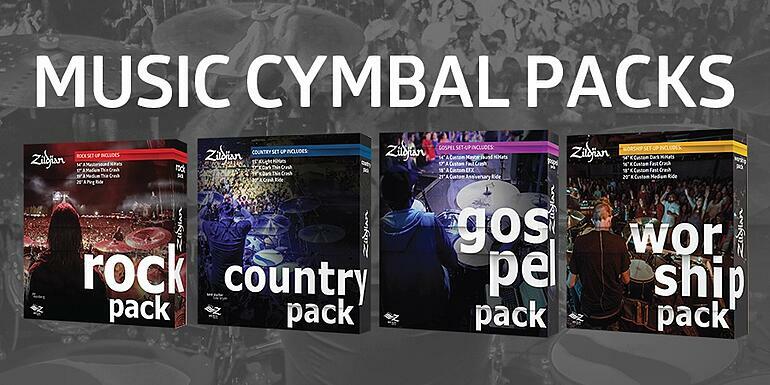 We are excited to announce four new music genre cymbal packs for playing Rock, Country, Gospel and Worship styles of music. With so many choices available, our cymbal experts have honed in on the particular sound characteristics of each style of music and matched them with solid cymbal choices that will work across a variety of songs for each genre. Designed for churches, worship houses, clubs, venues, live theaters, schools, lesson rooms, etc, these cymbal sets are a great "all around" choice for any "house drum-set" or for any drum-set in your house! The Josh Dun Artist Series stick is built to stand up to the aggressive grooves that drive Twenty One Pilots. It features a beefed up 5A shaft with extra length for more reach and effortless velocity. Its medium taper keeps everything in balance and the oval tip creates a surface area ideal for punchy drums and bright cymbals. On this eye catching red stick is a reproduction of Josh’s signature and the Twenty One Pilots’ Skeleton Clique “Alien Josh” logo. The Thomas Pridgen Artist Series stick is bold and aggressive by design. Its extra length combined with a short taper pushes more weight to the front of the stick, allowing the diameter to stay in the sweet spot between the 5A and 5B. A large oval tip translates all that power into fat sound on the drums and plenty of volume from the cymbals. This natural color stick features Thomas’ illustrated character logo. The new 9 Gauge stick provides an exciting center point to Zildjian’s popular Gauge Series. Clocking in at .563 – the world’s most widely played stick diameter – the 9 Gauge sits in an ideal comfort zone for most drummers and is an extremely well-balanced stick, capable of producing an exceptional cymbal sound. All Gauge models (6, 8, 10, and 12 Gauge) proportionately feature the finely-tuned properties of the 9 Gauge and Zildjian’s new Fusion tip shape that combines elements of an acorn and a round tip for bright, focused cymbal sounds. Let us know what you think of our new line up for 2017! Of course, there's no substitute for putting wood to metal, so get down to your favorite authorized Zildjian retailer to check them all out for yourself.